It’s hard to make homemade meals every night between working full time, teaching water aerobics twice a week and carting the twins around to their various functions (I swear they have a busier schedule and social life than I do!) However, with all of the pre-made meals and other conveniences (such as shredded cheese, cut up vegetables, etc.) available in most grocery stores, I don’t need to always start from scratch. I call this section of the blog “Cheats” and will share some of my shortcuts to make tasty meals and my life easier. 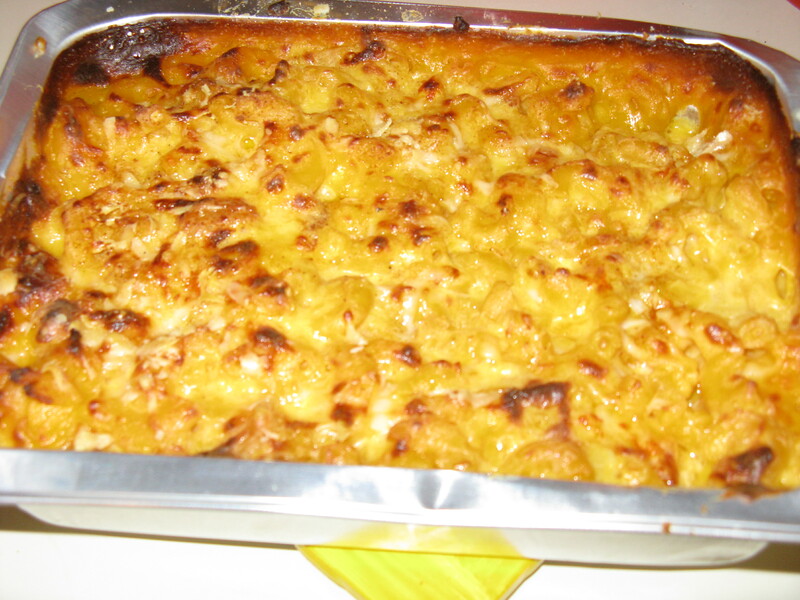 The first is one of my favorite comfort foods – macaroni and cheese. I have never been a fan of boxed mac and cheese – Ick. My Dad always made it homemade, complete with the breadcrumbs on top. After I left the dorms in college, where all I could afford was the boxed stuff, I swore I would never eat it again. And I have lived up to that promise. 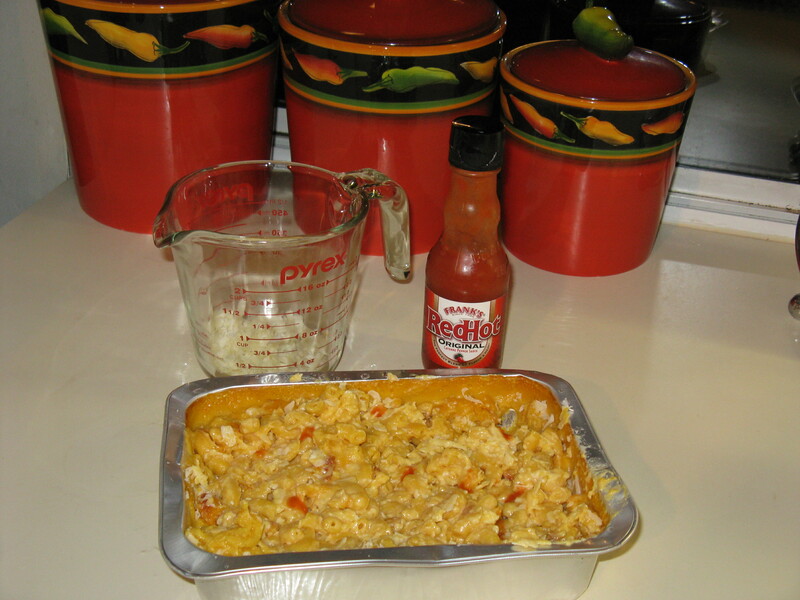 I must admit I do like Stouffer’s frozen macaroni and cheese – it will certainly do when I don’t have time to make homemade. Luckily, I recently stumbled upon a pre-made mac and cheese that is pretty darn good. 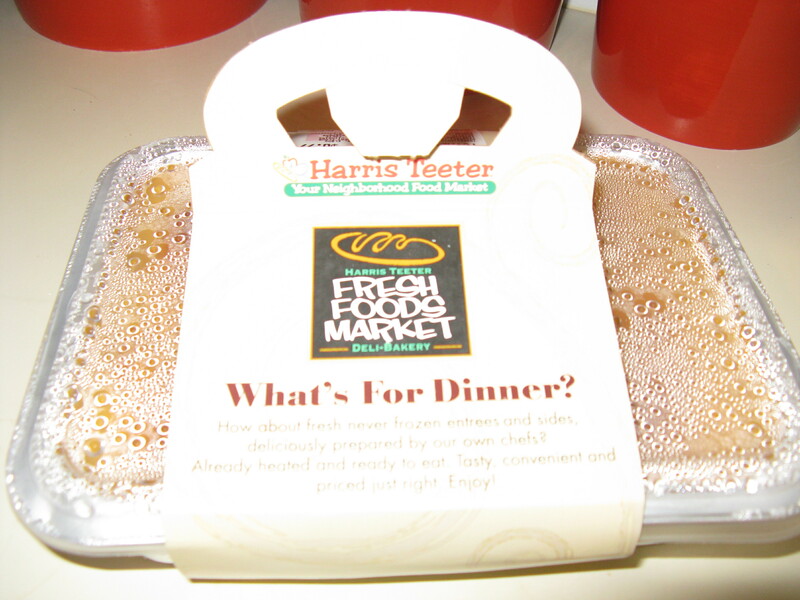 Most Harris Teeter grocery stores sell already cooked whole chickens (the garlic ones are great!) The other day in that same section where HT keeps the chickens warm, I noticed it also had premade broccoli and rice casserole, meatloaf, precooked ribs and, yes, macaroni and cheese, which I immediately scooped up. It was really good – Gabe even liked it. But, me being me, I decided to raise it to another level. HT uses cheddar as its cheese of choice, which is great by me. I added some asiago for a little kick. I like the asiago for its nutty, semi-sweet flavor, but you could easily use a different kind of cheese to your liking (I’m going to try pepperjack next time.) I also add a bit of milk to keep it creamy, some Tabasco, seasoned salt and buttered bread crumbs (see recipe below). OMG, you would never know that this wasn’t made from scratch. Gabe prefers his without the breadcrumbs, so sometimes I’ll leave them off, depending on how nice I want to be. This stuff is pure comfort either way, for sure. Preheat oven to 350 degrees. Fold in the asiago cheese to the HT Mac & Cheese. Stir in the milk, Tabasco and seasoned salt. Spread the bread crumbs on top, dot with butter or margarine. Heat about 10 minutes, until the cheese is melted and the bread crumbs are brown. If you don’t include the bread crumbs, broil the Mac & Cheese for a couple of minutes. 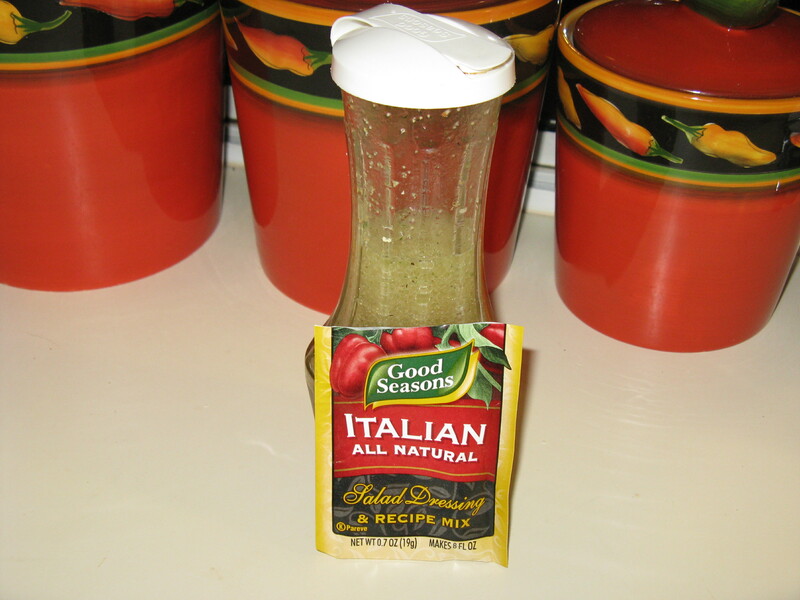 I serve this with a simple salad of tomatoes and either avocados or cucumbers, tossed with Good Seasons Italian Dressing (another great cheat!) Just add vinegar, oil and water to the spice package, and you have one tasty dressing that beats the bottled stuff hands down. So, what are some of your favorite shortcuts? 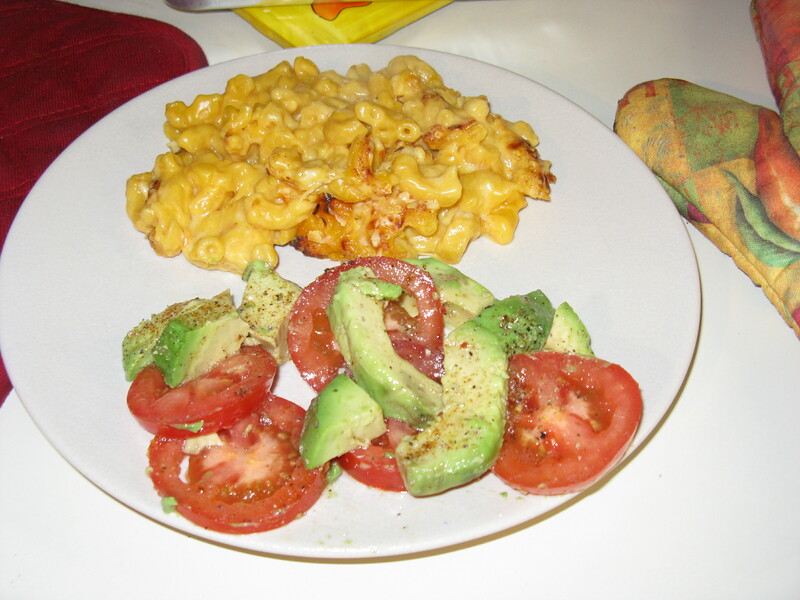 This entry was posted in Pasta, Rice, etc., Recipes and tagged Asiago cheese, comfort food, Food shortcuts, Good Seasons Italian Dressing, Harris Teeter Macaroni and Cheese, Kelley Chisholm blog, Mac and cheese, Macaroni and cheese, Pre-made meals, tomato and avocado salad, tomato and cucumber salad. Bookmark the permalink.